DALLAS – According to Statistic Brain, more than 35 percent of Americans have already broken their New Year’s resolutions. 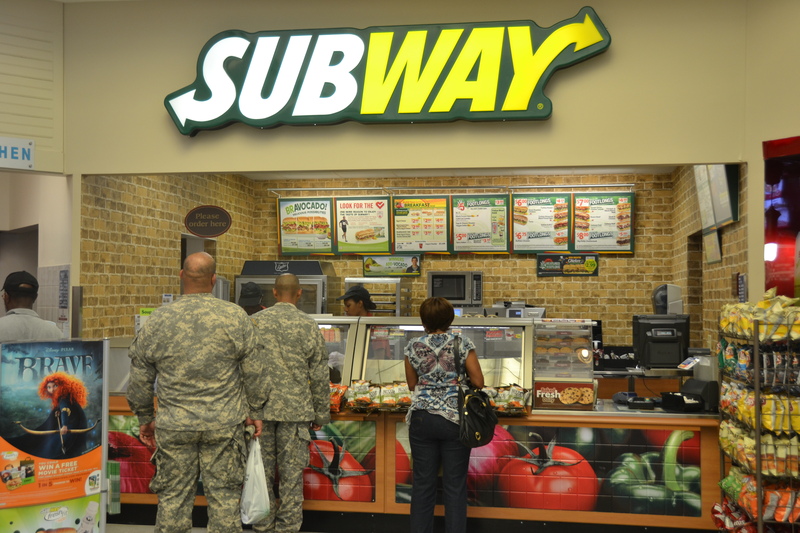 The Army & Air Force Exchange Service is doing its part to make it easier for troops, and their families, to maintain their “bottom lines” when making dining choices on and off duty. The Exchange School Meal Program, which provides more than 24,000 lunches daily to overseas school children, discontinued frying in all schools and offers gluten-free and vegetarian meals. The schools also serve whole grain breads, cookies and rice, 100-percent fruit juice, reduced fat and/or low sodium entrées as well as an expanded assortment of fruits and vegetables. Dining in the Exchange Food Court doesn’t have to be a resolution-buster as virtually every establishment offers healthy dining options. Popeyes Chicken has created a menu platform called “Louisiana Live Well” which features 20 menus offerings, all 350 calories or less, that are full of Louisiana flavor. They have also created three new salads that meet the Exchange’s Operation BeFit criteria that began testing in December and should roll-out in spring 2014. The Exchange has also introduced Coke Zero as a beverage option at all Continental United States Food Court locations. Subway has led the charge by being the first fast food restaurant to earn the American Heart Association heart check for heart-healthy meals. Subway Fresh Fit® choices certified by the American Heart Association include eight different subs with six grams of fat or less. Charley’s Philly Steaks is transiting from a two size platform to three sandwich sizes. This initiative was to introduce a less filling, smaller sandwich size for the lighter eaters. The Exchange will transform all CONUS stores in the first quarter of 2014. Burger King offers an online “Build-a-Meal” menu that reveals nutrition facts for various meal combinations. Burger King also allows diners to select a side salad instead of fries for the same price and offers 10 menu items less than 500 calories that meet the Exchange’s Operation BeFit criteria. In addition to Subway and Burger King, 12 other food court options, including Taco Bell and Pizza Hut, offer a wide variety of resolution-worthy initiatives. AAFES restaurant nutrition information is available online at http://www.shopmyexchange.com/docs/nutrition.pdf. While gassing up the car at the Express, military shoppers can also fuel up inside as healthy options abound throughout the store. Snack Avenue offers fresh salads with less than 300 calories as well as chilled fruit cups and oatmeal. The Fresh Fruit program, which has been in operation for several years, offers bananas, apples, oranges, limes and lemons in nearly 400 facilities. Exchange Expresses offer customers a wide array of meal replacement options such as PowerBars, Clif Bar, Zone Perfect and Detour Bars, all available in assorted flavors. 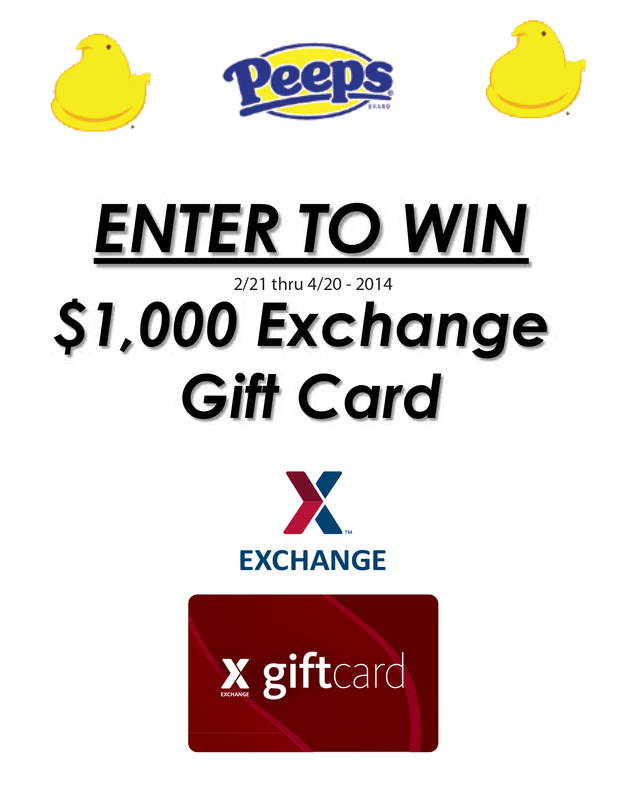 DALLAS – The Army & Air Force Exchange Service is partnering with Just Born, the maker of Peeps, to hatch up an “eggciting” sweepstakes for a chance to win one of 20 Exchange gift cards worth $1,000. From Feb. 21 through April 20, shoppers worldwide can enter to win the Peeps Just Born sweepstakes by filling out and dropping off an entry form at any Exchange store. Shoppers must be 18 years or older to enter and have a valid driver’s license. The drawing will take place on or about June 2. For more information or to schedule an interview with an Exchange representative please contact Kelsey Kirsch, 214-312-4566 or kirschkm@aafes.com. DALLAS – Home sweet home just got even sweeter for the most recent winners of the Army & Air Force Exchange Service’s yearlong Homeward Bound campaign. This time, three military families took home prizes courtesy of Ashley Furniture. The winners, Sgt. Mario Amador, deployed to Kuwait from Fort Carson, Colo.; Jaime Cox, a military spouse from Fort Hood, Texas; and Jessica Wilson, a military spouse from Fort Bragg, N.C., received a room full of furniture worth $1,500. “Home is where the heart is, and I’m happy the Exchange can help make coming home—whether it’s from deployment or daily activities—even more special,” said Col. Tom Ockenfels, Exchange chief of staff. The Exchange’s yearlong Homeward Bound campaign celebrates the homecoming of troops and honors the sacrifices of military spouses and families. The initiative includes monthly contests and special pricing on popular items throughout the year. The Army & Air Force Exchange Service is a joint nonappropriated fund instrumentality of the Department of Defense and is directed by a Board of Directors which is responsible to the Secretaries of the Army and the Air Force through the Service Chiefs of Staff. The Exchange has the dual mission of providing authorized patrons with quality merchandise and services at competitively low prices and generating nonappropriated fund earnings as a supplemental source of funding for military morale, welfare and recreation programs. To find out more about the Exchange history and mission or to view recent press releases please visit our Web site at http://www.shopmyexchange.com. DALLAS – As service members return to the United States, the Army & Air Force Exchange Service is marking their return with a contest to find the best homecoming stories and photos. Authorized shoppers can share their special moments from Feb. 7 to 28 by submitting a story in 150 words or less for a chance to win one of two Lenox® Thomas Blackshear sculpted figurines valued at $195. The two collectibles, a female version called “Home at Last” and a male keepsake titled “Coming Home,” are available in black or ivory. Five winners of the Exchange’s Thomas Blackshear figurine giveaway will be notified on or about March 14. No purchase is necessary and entrants must include their name, email and home address, name of the nearest Exchange, daytime phone number, rank or occupation of sponsor. There is a limit of one entry per family. For complete details visit www.shopmyexchange.com/patriotfamily. Make some green while you clean! DALLAS – Clean up and cash in with the Army & Air Force Exchange Service and Kimberly Clark as they team up to give away ten $1,000 gift cards in the “Spruce Up Your Space” sweepstakes. “The only thing that could make the coming of spring more satisfying than an annual cleaning is getting paid to get your house in order,” said the Exchange’s Chief of Staff Col. Tom Ockenfels. “Spruce Up Your Space” sweepstakes entry forms are available in Exchange stores, from Feb. 7-13. Winners will be selected on or about March 14. The Army & Air Force Exchange Service is a joint non appropriated fund instrumentality of the Department of Defense and is directed by a Board of Directors which is responsible to the Secretaries of the Army and the Air Force through the Service Chiefs of Staff. The Exchange has the dual mission of providing authorized patrons with quality merchandise and services at competitively low prices and generating non appropriated fund earnings as a supplemental source of funding for military morale, welfare and recreation programs. To find out more about the Exchange history and mission or to view recent press releases please visit our Web site at http://www.shopmyexchange.com. DALLAS –A video capturing a Fort Bliss family’s heartwarming reunion took home the $10,000 grand prize in the Army & Air Force Exchange Service’s Homeward Bound photo and video contest. Laura Jimenez’s touching video, titled “My Heart Back Home,” featured Jimenez and her young son welcoming home her husband, Sgt. 1st Class Jesus Jimenez, from a yearlong deployment to U.S. Forward Operation Base Shank in Afghanistan. Laura Jimenez received a $10,000 Exchange gift card for her entry, one of 672 homecoming photo and video submissions the Exchange received for the contest. The video featured black-and-white photos of Jimenez and her son, Leonardo, who was born just 26 days before Sgt. Jimenez deployed. Photos of Jimenez and her husband on their wedding day and other images of the couple were shown as well. The end of the video captured footage of the family reuniting when Sgt. Jimenez returned to Fort Drum, N.Y., where the family was previously stationed. The Fort Bliss Exchange honored the Jimenezes with a ceremony to present them with their prize. Laura Jimenez’s sister, Lola Gomez, a photography student at Daytona State College in Florida, created the winning video as part of a class project. Gomez gave the video to Jimenez as a gift, and Jimenez then entered it in the Exchange’s Homeward Bound contest. Jimenez is using some of her winnings to buy her sister a computer and camera lenses. The family is spending the rest of the prize on everyday necessities, such as gas, dry cleaning and household goods. “Being a military spouse is a hard job, but I’m pleased to do it. I’m proud of my husband, and I love being there to support him when he needs me,” Jimenez said.